Once a local boy makes good as a teen heartthrob and dramatic TV star, there’s no going back. Except to film on location. He said that. The publicist, that is, who says that Johnny said that and he’s quoting. Johnny, by the way and for the record, decided against chatting with Joan and Charlie on Good Morning America this morning. Ballpark cost: $15,000, maybe $20,000 for the unused satellite feed. Not up to it. He smokes Marlboros. He drinks Evian. He lost his virginity at 13. We got this while watching him at 60 paces. The forest of eyelashes is tough to spot at 60 paces. Especially since he’s wearing dark sunglasses. No prob. We’ll ask him to take those off in four hours. 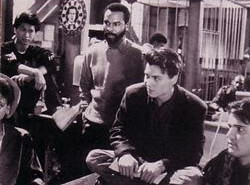 In the meantime, the Fox Network’s 21 Jump Street will do some business and make television. They will do it on Miami Beach at Penrod’s in the midst of a video-induced Spring Break. It will be tasteful. It will be classy. It will include Jell-O boxing with women in bathing suits and lingerie. Just collecting quotes here in case Johnny brings up Jell-O. Got to have something unshakable prepared. There is something interesting about a man who has so many women around him but longs for only one—one relationship that is, not just one at a time. It makes you like him. Are you at all disappointed in him? She looks at you like you just drank Drano. We chat about stuff you chat about with a 20-year-old thespian. She is, quite frankly, wearing thin on all this glamour after nine days of shooting with a “real male” crew and a “real male” attitude. Her character, she says, isn’t what she thought it’d be. She thought it’d have some dimension. That she would be more than a bathing suit to stand next to Johnny. Is this what they call paying your dues? Worried that we might have missed a People bulletin, we check to make sure it’s the girl we think it is. The engaged thing doesn’t stop Mrs. Depp wanna-bes. Gotta cover that which the G-string does not, the producer says to one of 400 extras. OK, says the tall brunette in the neon-orange string. But gotta walk by Johnny first. Do a half-gainer in front of him. Hold her best assets in front of him and get whatever attention he’s got left. Which, judging from his response, is precious little. It may also be self- preservation. We’ll ask about that. In the meantime, we’ll ask the special guest star, Shawn Levy, good-looking Yale Drama School grad. He talks about how these women have “automatically glorified me into some kind of secular god.” This kid is not pulling your leg. He is genuinely horrified. Embarrassed. He shakes his head and worries about our boy John. This, then, is the education of Shawn Levy. That the work is nifty but they do not pay you for the work, they pay you for the hassle. Shawn is worried a bit about how, in this post-modern era, what is real is modeled after what is make-believe instead of the other way around. You worry about what you’re going to say to Johnny. Isn’t it a testament to how we’ve exploited actors that the mere fact that he would think of saying that is surprising? Now to cut to the real chase: The camera loves Johnny. Sitting there in the cap that reads: Sun Your Buns on Miami, Florida, he could be the boy-next-door. Through a lens, he is not. He is all angles and pout and dark edges and one darn meaningful earring. The women hang. The girls hang. The boy’s every move is calculated, analyzed and memorized. He smiles slowly, if at all. He smolders when he wants. It is effortless. Bill is talking about Depp and women. Sandee Seamans, 21, Miami: “He talked to me. He asked me where I live.” She’s atwitter. Kerrie Eubanks, 10, Lake Worth: “He signed this.” This is a torn piece of a teen magazine, “How to Sweet Talk Johnny Depp.” She’s atwitter. Johnny has smiled for her. The thing, by the way, about having to ask his permission to snap his photo is absolutely true. Even for Kerrie. Around 6, Peter DeLuise’s smile grows wan. 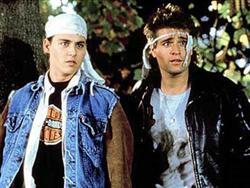 The other Jump Street draw, DeLuise (son of Dom) is making up for the lack of Depp. He does it, interestingly enough, with indignation. He is mad because Jump Street is not telling it like it is. And this show, about young cops gone undercover, usually shot in Vancouver, British Columbia, is known for the opposite. So DeLuise went to the powers-that-be and got nowhere. He has decided to pick his battles and, oh, this isn’t one of them. Fine, fine, fine. Let’s talk about his best friend Johnny. He isn’t tired, and this is not a bad day. This is disgust at that which has brought those 400 people here and what has brought us here. Just then, Johnny Depp takes his cue from across the Penrod’s driveway and begins to hop and laugh and wave things. “It’s been a long time since I saw Johnny clown like that,” says producer Joan Carson. You wonder what we’ve done to him that he stopped that somewhere along the way. That a DeLuise lost his sense of humor. It is now 7 p.m. More than a dozen girls are hanging out in front of the main boy’s motorhome. Still. He has called a halt to the publicity whirlwind that has seen him talk to one reporter from Australia. On the wall at Penrod’s is this sign: Know when to say when. Now would be a good time. So there will be no interview. That’s right, no glimpse of the forest of eyelashes. No talk about Marlboros or Band-Aids or Jell-O. 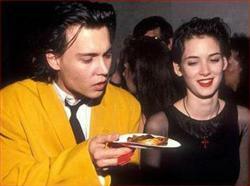 No Winona, no post-modern symbolism, no meaning of life. And no regrets. We owe him that. —21 Jump Street shows locally at 8 p.m. on Mondays (WSVN-Ch. 7 and WFLX-Ch. 29). The Spring Break episode is scheduled for broadcast on Feb. 19.